This accessory set comprising genuine Camptech products is compatible with all Camptech Airdream 390 and Starline 390 Inflatable porch awnings. These Storm Straps allow for a more secure pitching of your inflatable awning during inclement weather conditions, attaching to the buckles already sewn onto your Camptech awning. 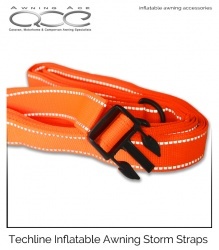 Pack contains two straps with male buckle assembly, adjustable buckle and strong steel pegs. Rear uprights are used to form a better seal between your inflatable awning and caravan. 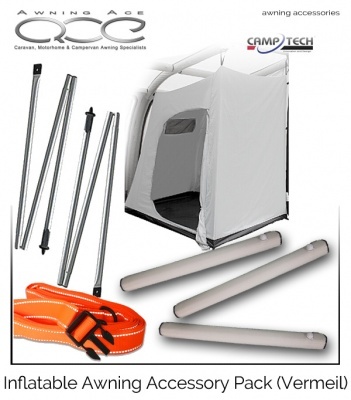 The poles compress the awning bumper pads against your vehicle and are secured in place using the c-clips sewn onto your awning. 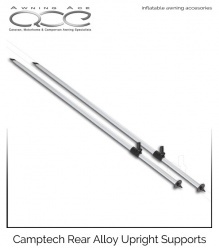 These lightweight alloy poles are incredibly strong and durable with adjustable height clamps, covered pocket ends and foot spikes. Inflatable Veranda Air Pole for use with the Camptech 390 air awning. Simply inflate the tubes and place between the main uprights to improve lateral stability and create a lovely veranda style front aspect to your awning. Easy to inflate with your existing awning air pump. Hangs within the main body of your awning Tailored to fit your Camptech Airdream Inflatable awning, this extremely useful and easy to hang bedroom inner accommodates two adults in comfort. With a fully sewn in groundsheet, the bedroom makes a superb self-contained area for a great night sleep. Breathable polyester materials with a large ventilation panel help to minimise overnight condensation whilst the large side access door allow for easy entry and exit. The inner bedroom tent can be hung in seconds utilising pre-sewn rings located within the awnings roof air beams and can be removed during the day and stored in its own drawstring protective bag. Perfect for those who need to increase their sleeping accommodation at short notice or who prefer to sleep under the stars.